As a teacher and a daily integrator of technology, I'm always on the lookout for ways to enhance my classroom's access to texts. 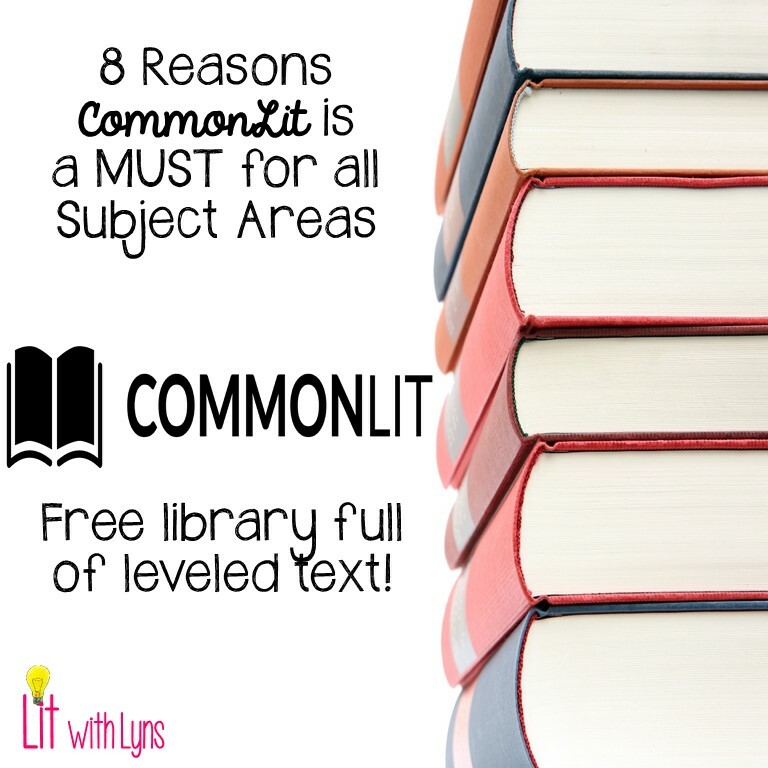 When I discovered CommonLit, I felt I had truly hit the jackpot! If you're not familiar with this amazing, FREE tool, it's a digital library of leveled texts. You can find anything from news articles, texts about specific people, poems, short stories, and historical documents.... the options are endless! 1. Great Search Filters- Commonlit pretty much takes the cake in the way of offering practically every filter option you would want! When looking through their library, you can filter your search by Lexile Level, grade, genre, theme, literary device, standards, and even languages! 2. Easily Differentiate- I'm ALWAYS on the lookout for ways to differentiate, particularly with technology. Any time I find a tool that allows for differentiation, I do my best to share it with everyone I know. Commonlit makes differentiation EXTREMELY EASY! Teachers can use the guided reading format, which breaks the texts into chunks. Guided questions are ungraded questions that students are required to answer if the guided reading mode is being used. The student can't move forward with reading the text until they get the question right. Students also have the option to have the text read aloud to them. Even better, the teacher doesn't have to assign the guided reading mode to the whole class. You can choose specific students who would benefit from this, such as struggling readers or English Language Learners. 3. Easily Annotate the Text- Using the highlight feature, you can have students highlight the main idea, words they don't know, textual evidence... whatever is beneficial for your students. If they make a mistake, they can easily fix it with the eraser tool. 4. Paired Text & Related Media- The majority of the texts come with paired texts and related media options. The paired text includes a brief explanation of how the article/story relates to the one you originally chose, as well as suggestions for use. I'm a little obsessed with the related media option because this saves me from having to find additional ways to encourage critical thinking. The videos come from Ted Talks, Youtube, and more. 5. View Analytics on Assignment Report- Each text typically includes several types of questions: guided, assessment, discussion, and short response. The teacher can choose which type they would like students to answer. If you assign the assessment questions, the multiple choice is automatically graded for you. The scores will appear on the assignment report. 6. Easily Implement Writing with Short Responses- The last discussion question is usually the short response. This is a great way to have students use evidence from the text to support their answer. Short responses are the only part teachers have to grade on their own. CommonLit has an awesome 4 point rubric you can use to do this. 7. Assign Text to Specific Student or Group- CommonLit has a special feature that allows you to assign a text to specific students, rather than assigning it to the whole class. If you have students who need extra help or are out sick for several days, you can assign texts just to that individual. You can also assign certain texts to specific groups. For example, let's say you're doing a unit based around the theme Family and Friendship, and you have assigned each group to a certain topic related to this theme. You can then assign each group to a text that would apply to their given topic. It's a great way to differentiate learning! 8. 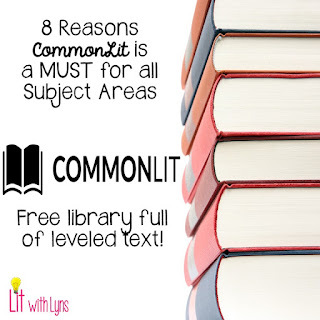 Flip Your Classroom- I often assign a text from CommonLit for students to read at home. That way we can get right to our discussion questions or short response when they come into class. If students don't have access to the internet, you can always print a copy. All texts come with an option to print the article/story as well as the questions. If you use CommonLit, I would love to hear how you do so. Tell me about it in the comments below.